“It is in fact mainly the postcolonial imagination, with its contested relation to Eurocentric discourses (…)”, as keenly observed by Carla Sassi (12), “that has taught us to reassert spatiality as a factor that bears the same impact over human activities as temporality” (12). For that reason, drawing succinctly on Jahan Ramazani’s theorised notion of “transnational poetics” (A transnational poetics. University of Chicago Press, Chicago, 2009) and on Philip Nanton’s concept of “the frontiers of the Caribbean” (Frontiers of the Caribbean. Manchester University Press, Manchester, 2017), the essay attempts to investigate how Kei Miller, a Jamaican-born and sometime Scotland-based poet and prose writer, creatively explores the nexus of (transatlantic) geographic translocation, identity transition and cultural transference, as evidenced by a selection of his poems and essays, many of which originated as his blog posts (http://underthesaltireflag.com/) that the present text owes its title to. Starting from the close reading of “In This New Country”, the opening section of his second volume of verse—There Is an Anger That Moves (There is an anger that moves. 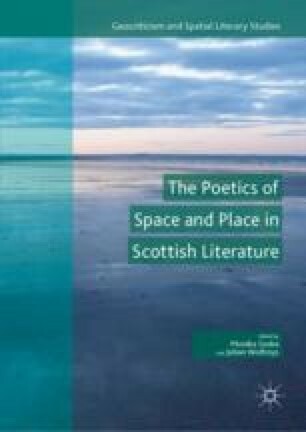 Carcanet, Manchester, 2007a), the essay zooms in on Miller’s pluralised narratives of the Caribbean, Scotland and beyond with a view to among others focusing on, in his own words, “a complex interaction and negotiation between notions of local and foreign” (Writing 45), on their interrelatedness and ingenious interplay frequently producing a third space of meaning. Delaney, Sam. ‘Could Scotland Be Northern Europe’s Caribbean?’ The Guardian. 20 May 2011. http://www.theguardian.com/uk/2011/may/20/northern-europe-caribbean-scotland-rebrand. Accessed 15 September 2015. ———. ‘Interview’. Iota. No. 83 and 84 Spring, 2009. 67–70. www.poetrymagazines.org.uk/magazine/record9cf9.html?id=24192. Accessed 19 September 2015. ———. ‘Kei Miller: Next Generation Poets—Interview’. Poetry Book Society, 2014. https://www.youtube.com/watch?v=UGrs8QoHI-Y. Accessed 28 September 2015.